I’m not exactly sure where my taste for little luxuries came from, but I’m pretty sure it had something to do with my upbringing. It’s not that I grew up in the lap of luxury. Quite the contrary. I grew up in a house where every buying decision was based on spending the least amount of money possible. My mom believed in saving for big things, but when it came to everyday items, we always got the brand no one ever heard of. And not because it was an up and coming artisan brand either! Just once I wished we could get the brand everyone else was buying! This experience made a lasting impression on me, and when I began making my own money, I immediately rebelled against this way of living. I quickly learned the pleasure of investing in simple luxuries to raise the quality of day to day life. This is not to say you should spend recklessly or get yourself into debt. I’m talking about very small things and of course everyone needs to work within their own budget. But how much more delightful is life when you splurge on something you can easily afford, but just happens to cost more than the entry level version? Some people are averse to this notion, but I’m a huge proponent. Get the Chanel nail polish! It really is better quality, lasts longer and has a unique and exceptional palette of colors. And while it’s more than double the drugstore brand, it’s not a lot of money. This is what I mean by little luxuries. Top of the line items that are not out of reach. Maybe you’re not going out and buying a Ferrari, but there’s no reason you can’t indulge in some low level privilege. I decided years ago I’d rather buy one high quality item and live with fewer pieces, than buy lots of cheap items that I didn’t really love. This is the same approach I take with little luxuries in my every day life. A few big ticket sacrifices allow for more small pleasures, so let’s look at 10 sweet indulgences that will add joy to your daily life. 1. 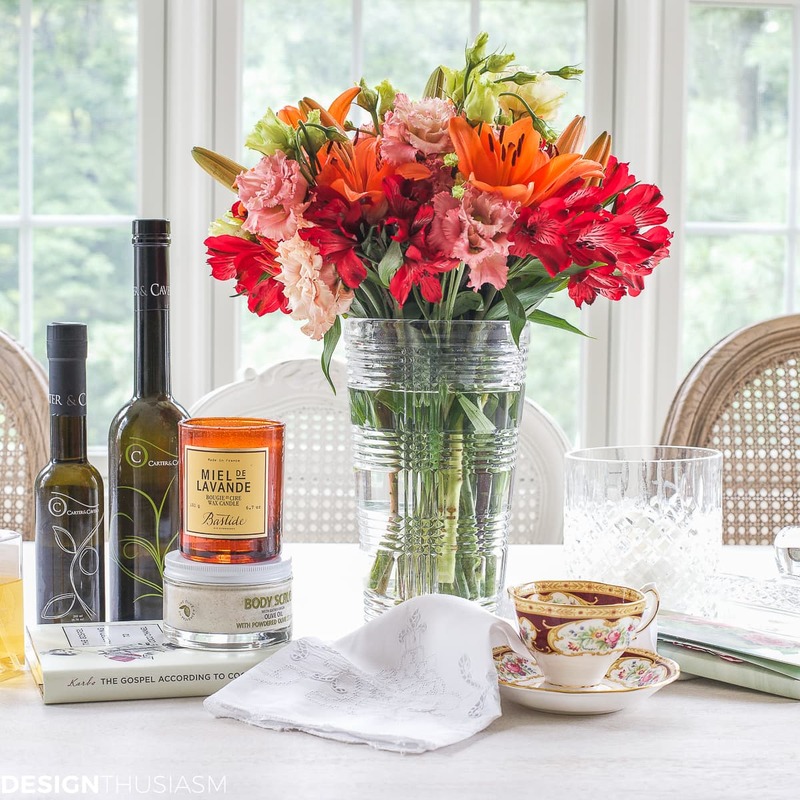 Flowers – ok, you all know I love flowers but did you know I started buying flowers when I was at my very first job? I used to stop at the street market every Monday and bring a small bouquet of flowers to my desk every week. This brightened my outlook at work and I would bring lunch from home twice a week to free up money in my budget to pay for the indulgence. All these years later, one of my favorite gift ideas (perhaps to yourself?!) 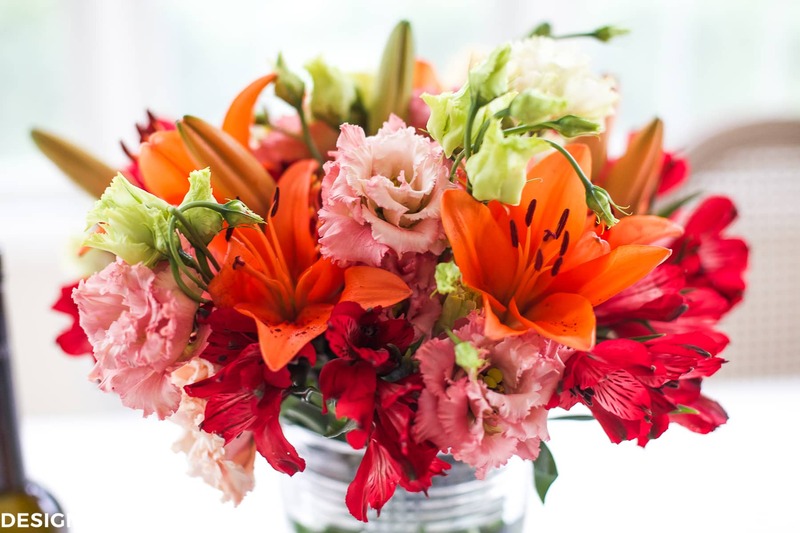 is a flower subscription. 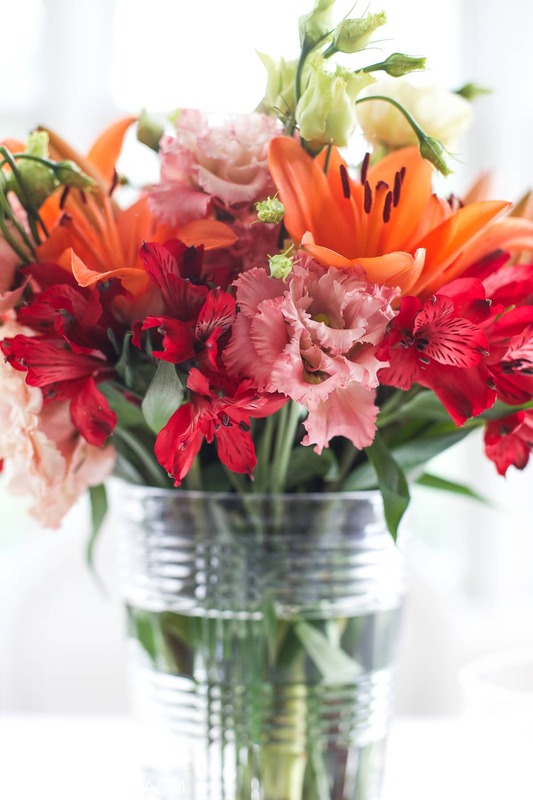 The gorgeous bouquet below is from my sponsor Enjoy Flowers, a wonderful flower subscription service that delivers fresh flowers to your door. There are a few flower subscription options at Enjoy Flowers and you can choose to receive your flowers either once or twice a month. I was particularly impressed with the packaging, which is designed to ensure your flowers are fresh and long lasting, as they are delivered directly from the farm, with the blooms carefully wrapped and secured in the box, and the stems perfectly placed in a container that keeps them moist. They sure last a whole lot longer than those street market flowers I bought years ago! 2. 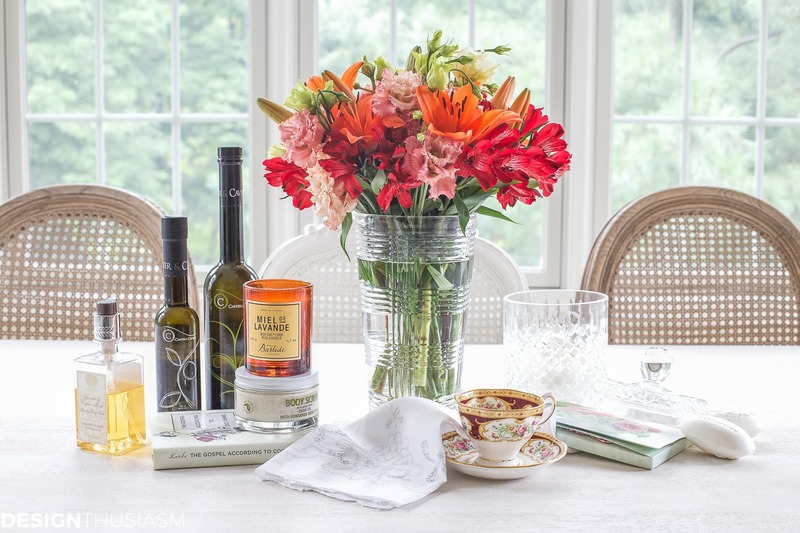 Aromatic candles – I typically love anything that pleases the 5 senses and wonderful smelling candles fit right in with that goal. All the better if they come in a beautiful glass container that can be re-used. In summer I love lavender, but I have many other favorites and I love to light them on ordinary days to add a little lift to my spirits. 3. 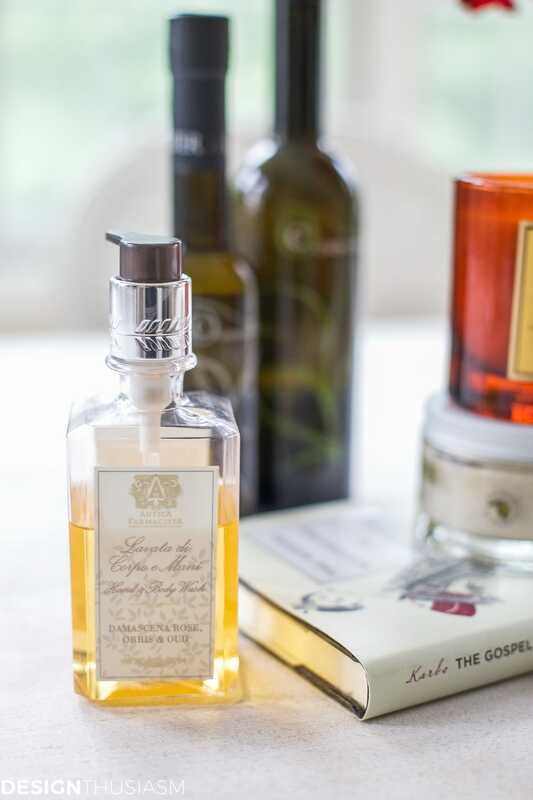 Body scrubs and lotions – It doesn’t really matter which you choose, as long as it’s something that utterly delights you. I enjoy trying new ones and often I’m influenced by the texture and scent, but I’m also a sucker for pretty packaging. Throw in a French name and I’m hooked! 4. Pretty note cards – In this digital age, it’s such a treat to get a hand written note. At the very least, I still believe in hand written thank you notes and I keep a collection of varied note cards on hand at all times. I pick them up whenever I see them and I’m completely charmed by the floral imagery. And here’s a funny quirk about me – I never use the last one in the package because I can’t bear to part with them! 5. Scented hand wash – I keep this lovely hand wash by my kitchen sink and I can’t tell you how much nicer it is than grocery dish wash liquid. Yes, I still keep some of that stuff under the sink, but when I come home from a day out, the first thing I do is wash my hands and bask in this heady aroma. 6. Little style books – I enjoy sweet little books that offer inspiration and lifestyle advice, whether it be etiquette tips or fashion and decor tricks. 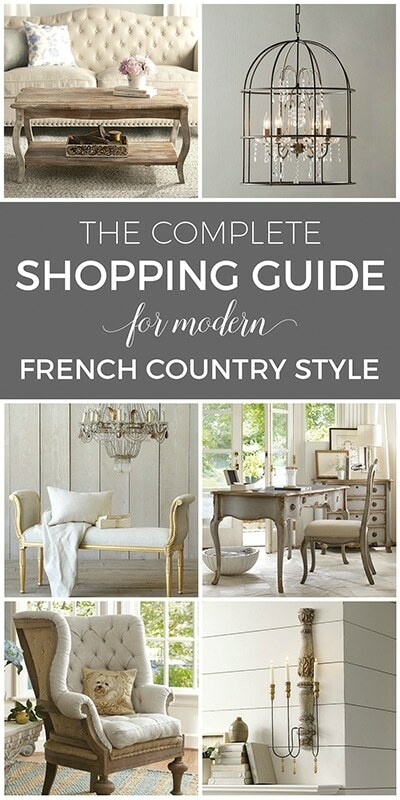 Lighthearted reading, often with a French theme are titles I love to keep around my home. This one is “The Gospel According to Coco Chanel”. 7. 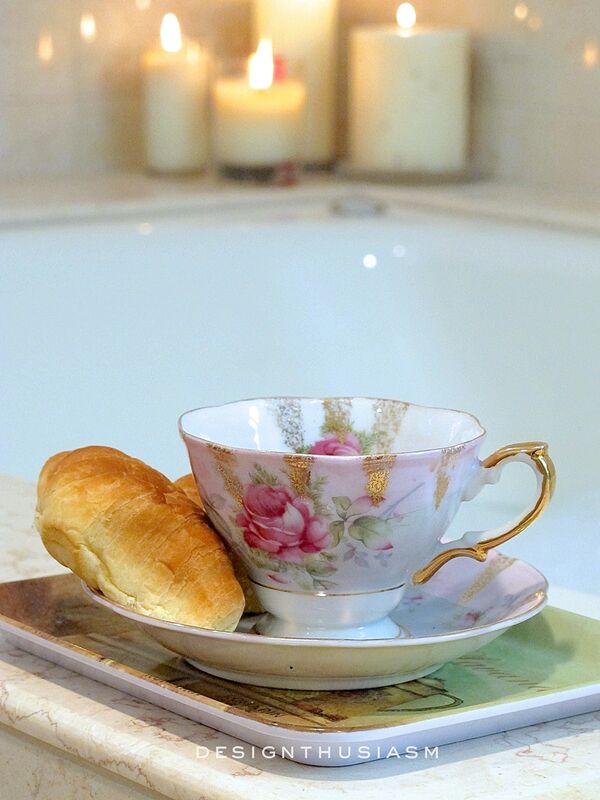 Vintage English teacups – this one is an absolute favorite of mine! I’ve been collecting teacups for years and I really can’t say why they enchant me so much, but it’s so much more pleasurable to drink tea from a beautiful cup than from that football mug hubby brought home from the ballpark. 8. 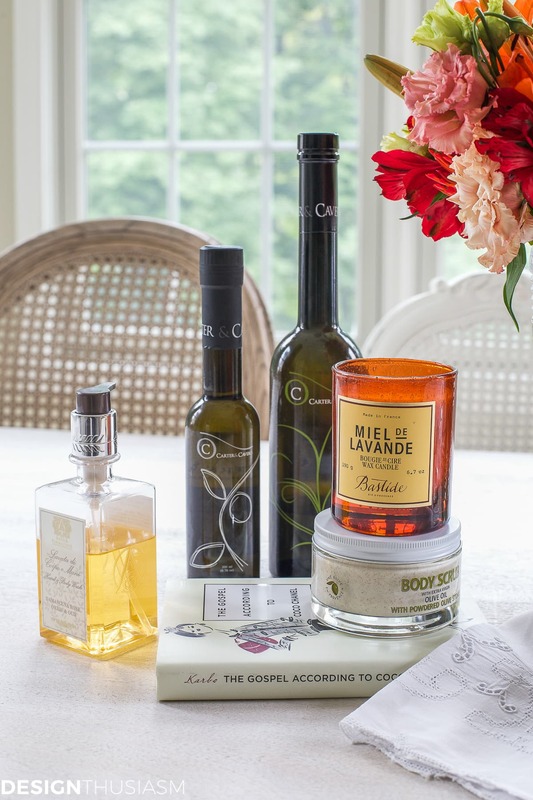 Perfumed soaps – in the same vein as the candles and hand wash, lovely French soaps are an exceptional treat. Extra points is they are carved with pretty flowers, these are gardenia scented and give the powder room a wonderful scent. 9. 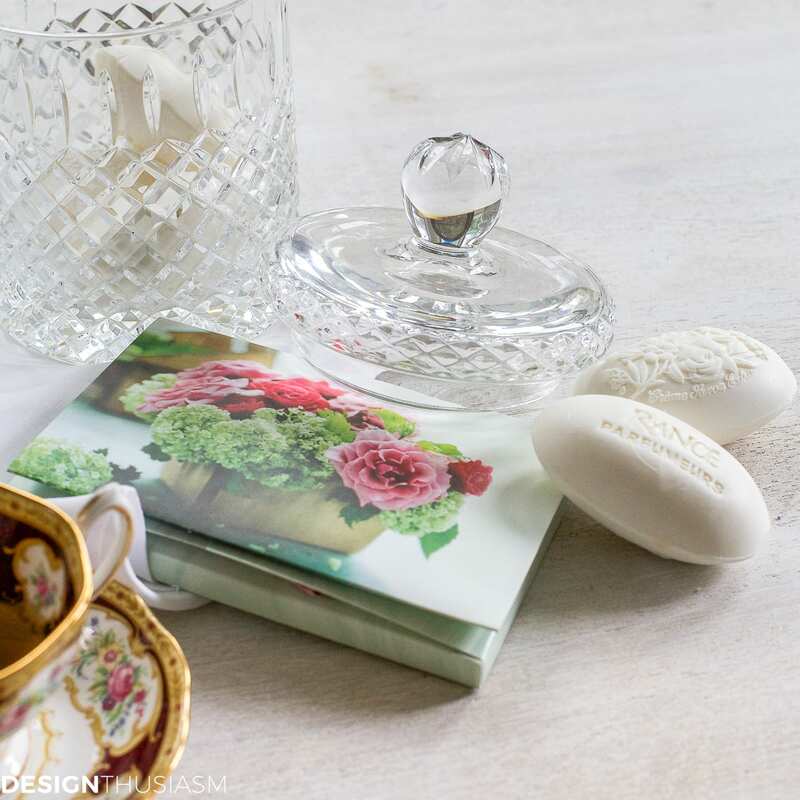 Cut crystal lidded jar – I’m fascinated with finding gorgeous containers for daily used items, to elevate my everyday routines to something special. How pretty the soaps look in this stunning jar, easy to see, yet covered to keep fresh. 10. 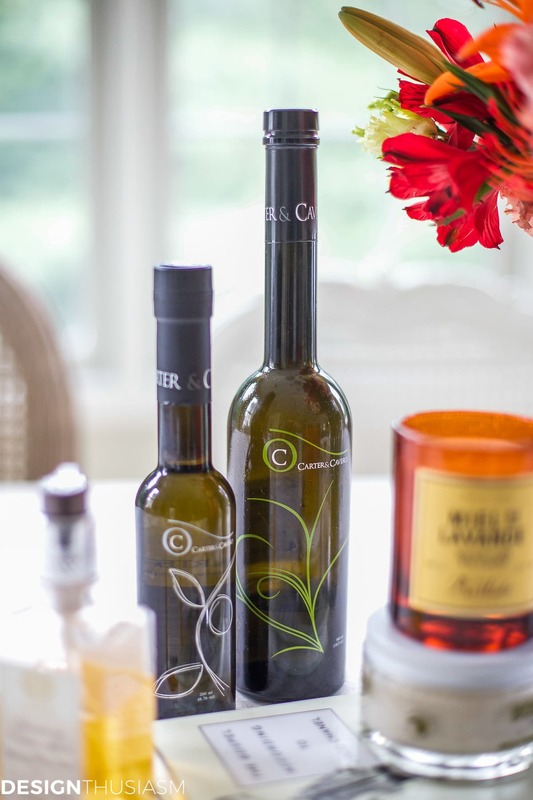 Artisan foods & oils – a few years ago I was gifted with these Carter & Cavero olive oils and I fell in love right away. I’ve since added flavors to my growing collection and they make a simple dinner all the more extraordinary. I also like artisan salts and other specialty items. 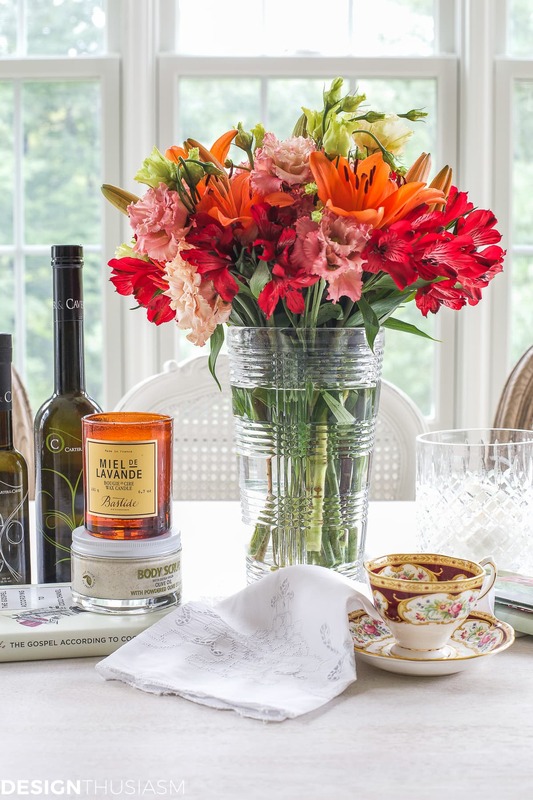 The list could really go on forever, and I’ve just selected some examples to show you how these little luxuries can add a touch of the exceptional to your ordinary routines. I try to do this in all aspects of my life, from the pens I use to the stamps I buy from the post office. Why go for the generic option when there’s a pretty floral or a “Love” stamp available? A huge thank you to Enjoy Flowers for sponsoring this post! They’re offering my readers a special discount of 10% off on all their products, including their already discounted pre-paid products. Just click the link and use the code LORY2 at checkout after signing up. This has to be one of my favorite articles. You described me to a ‘T’. You’re probably better than I am about using the soaps with carved flowers, but I have them. Good oils, Molton Brown pink pepperpod hand soap, teacups, and the Waterford clock, I gave my parents for their 50th anniversary. My favorite, Nouvelle candles in Mademoiselle. Little things make life sweet. Thanks for this uplifting post! One of your best posts ever. I agree with it all! Everything you listed are on my littl luxuries list as well. 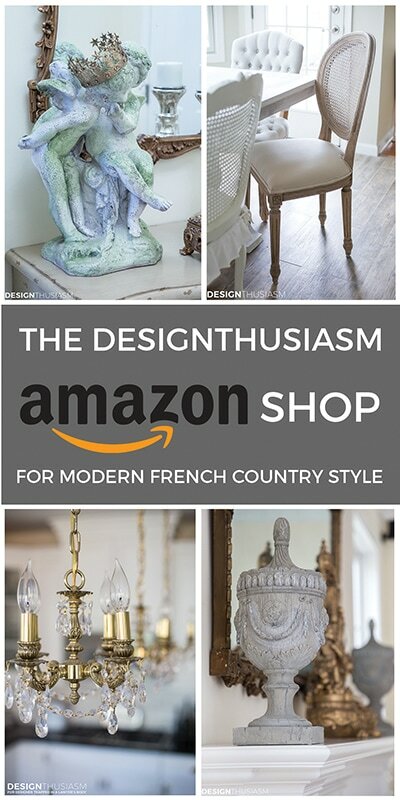 I giggled when I read teacups, notecards and beautiful scented soaps. I feel the same. Also, good candy in a pretty candy dish, one beautiful pen to write on gorgeous note cards, beautiful handkerchiefs to carry in your purse, and a plethora of exquisited small lamps illuminating every corner in the evening hours. Lory, We may share this interest because of our age. Most of us were raised by parents of the depression. Our parents only know SAVE. Ask more about the “exquisited small lamps illuminating every corner in the evening hours”, mentioned above by Katacrudul, please. Would like to know HOW to create that soft mood lighting in my home at night. What lamps to buy, light bulb (size, type), and where to stage them. Thank you! Lory–This is a wonderful post. We all need to take care of ourselves and treat ourselves more often. It’s is nice to know that someone shares my same thoughts. 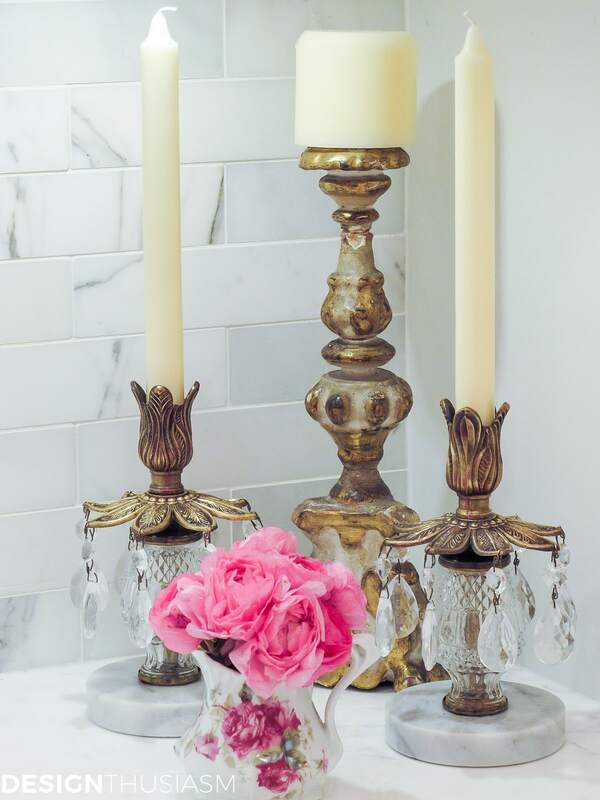 I always love seeing the beautiful flowers in your posts and the accessories in the photos which are inspiring. There is so much beauty in the world and it is important that we incorporate it, even if it is a small thing, into our lives. I couldn’t agree more Diane! I was actually delighted to see how this post resonated with my readers… 🙂 Clearly we’re all of the same mind! Lory, I agree with you and all other comments made. A beautiful post! Who deserves a little treat more than we ourselves? Love this post, Lory, and I absolutely agree! When we first met, the hubby insisted on buying inexpensive polos until after much nudging from yours truly, he became a fan of Ralph Lauren and Donna Karan. RL is my favorite American designer, hands down. I love his classic, iconic style, and the brand’s quality has always endured the test of time. By the way, I recognized your Glen Plaid right off, so pretty with your flowers; it’s one of my favorites that I’ve collected over the years. I love your beautiful teacups, too! I couldn’t agree with your philosophy more!!!!!!!!! We are worth these small over the top items. I do have problems with scented items that do not keep the scent. For this reason, I enjoy, YARDLEY, scented lavender soap. Keep this type of post coming! Yay! So glad to have inspired you… 🙂 Now you can enjoy the kitchen ritual a little bit. What a fun post! I grew up in a frugal home and I can understand my parents’ rationale…they raised three sons in the hills of Kentucky during the Depression. However, growing up I always wanted the brands that my best friend had. 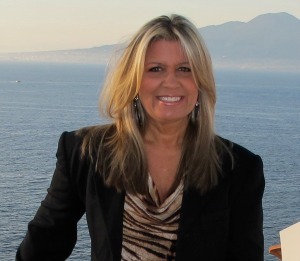 Then I married a very frugal man, so luxuries, big or little, were out of the question. It was as if my pleasure (or I) didn’t matter to him. Now I enjoy some of the small treats you mention in the post. Beautifully scented soaps, a fragrant billowy hand wash, really good nail varnish, fresh flowers (even a small bouquet), a nicely balanced pen to write with (I actually have good handwriting…another luxury), a lovely tea cup with a silver spoon, a beautiful compact that closes with that satisfying soft click, a vintage handkerchief… I think all these niceties reinforce our sense of ourselves, our well-being. I’m not proposing going out and spending a ton of money just to make yourself feel better…can you say “shopping disorder”? You have so eloquently listed the things that you enjoy and none of them cost the earth. These little indulgences are like a hug. I always come away with inspiration after reading one of your posts. This is so true, and very well said! I like that you called it a little hug you give yourself. Yes, I think luxury is really just defined as things that are a bit above what we might normally buy, so we each set that budget. We also each decide what we’re willing to give up in order to have these things. Keep enjoying!! I am so agreeing with you about the little indulgences. It’s just those little things that give you a ‘lift’. 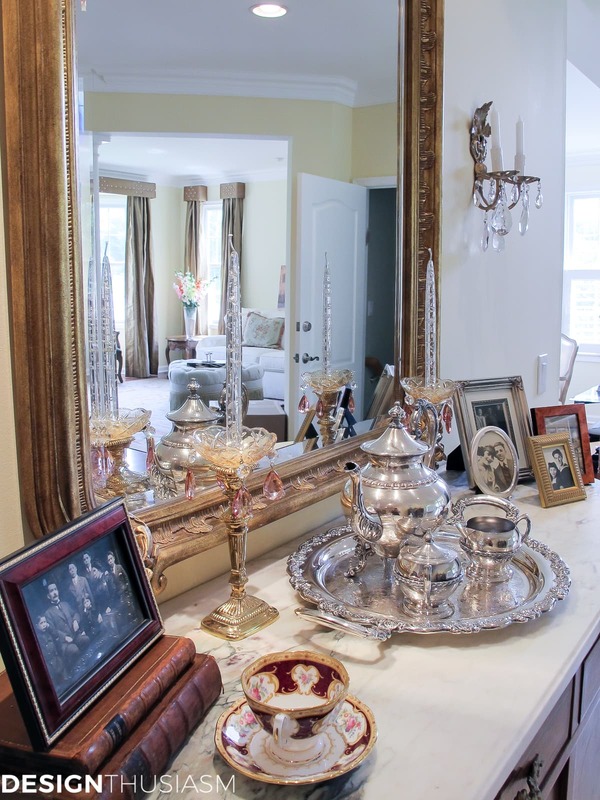 One of my passions is silver service pieces (they are in my bathrooms too) and when they are polished, there is nothing like it. 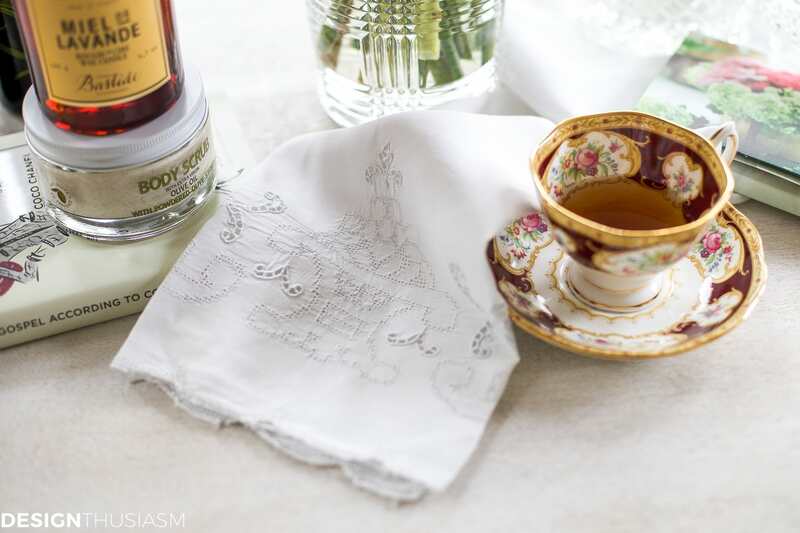 I love monogram linens, French soaps, lovely crystal pieces (also in the bathroom), flowers every week, special teacups for tea and nice little books that refresh the soul! You only live once, but if you do it right, once is enough . . .enjoy! This is a wonderful post. I am in the same camp. I would rather do without lunch or coffee out a few days a week and have flowers, wonderfully scented candles, and a few other little luxuries to indulge in. I truly believe it is about finding something that truly brings joy to your day. I truly have found my audience! You guys all think like me!! Are we long lost twins?? Like those above, I so enjoyed this post, and, like you, I would rather have one really beautiful thing than six that are just mediocre. I am sorry that I have to settle for really nice faux flowers instead of the lovely fresh ones – my precious cat, Miss Annie Mae Purrsalot, with leave the silk ones alone but there is no place where the real things are beyond her athletic kittycat reach. I also do the same thing as you with my notecards. I spend so much time finding special ones that I can’t bear to never see them again and the same with Christmas cards. Haha, so funny, Emily, that you do the same with note cards! Thanks so much for the kind words… 🙂 And while I love fresh flowers, I fill in with faux, too! I’m a little late to the party, but I wanted you to know that this is one of my favorite posts ever! Little luxuries don’t even cost money necessarily. A few years ago, I stayed at home for several weeks while recuperating from surgery, and I rediscovered the wonderful pleasure of using my whistling tea kettle, instead of heating water in the microwave. That whistle brought a sense of coziness and caring that the microwave could never achieve. I, too, love those delightful carved soaps, and use them in my bathroom all the time. I also order my own monogrammed stationery that seems to elicit many compliments. You MUST do more little luxury posts! Pretty please with sugar on top! My husband and I had this conversation recently and even discussed not discussing it with friends and family we thought wouldn’t understand. Does that make sense? He subscribes to the philosophy of getting that one good thing instead of a bunch of cheap things and after more than 20 years has convinced me to think the same way. I have come to believe it is actually less expensive in the long run. I’m glad he feels that way because I just so happen to love crystal, footed crystal and those pretty crystal jars with lids. I discovered when we moved recently that I had collected enough to fill the china cabinet! I actually use my crystal every chance I get to be able to enjoy it. We keep Q-tips in one of the lidded cut crystal jars in the bathroom. I haven’t been able to find my favorite soap since Target stopped carrying it but I’m looking! 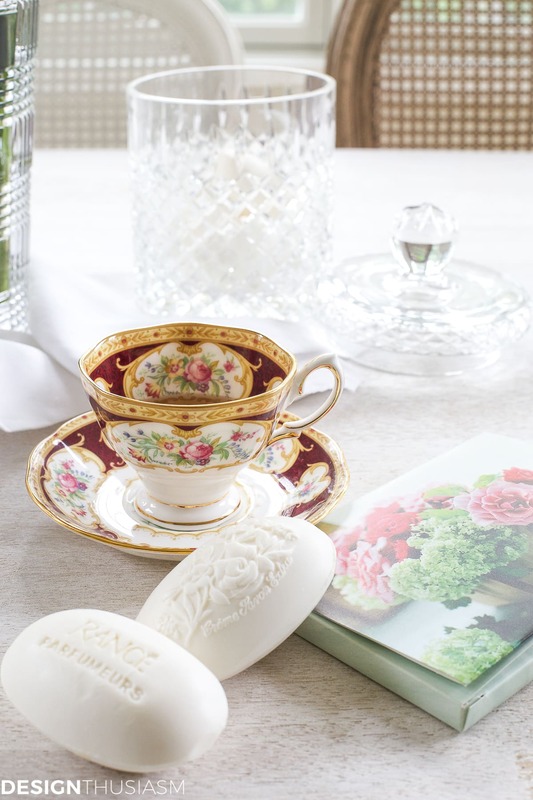 Those beautiful bone china tea cup sets are on my radar too! Love this! That’s exactly how I feel, Shirley!! So glad to have reached a kindred spirit… 🙂 And yes, I completely understand keeping it quiet because not everyone gets it… lol! 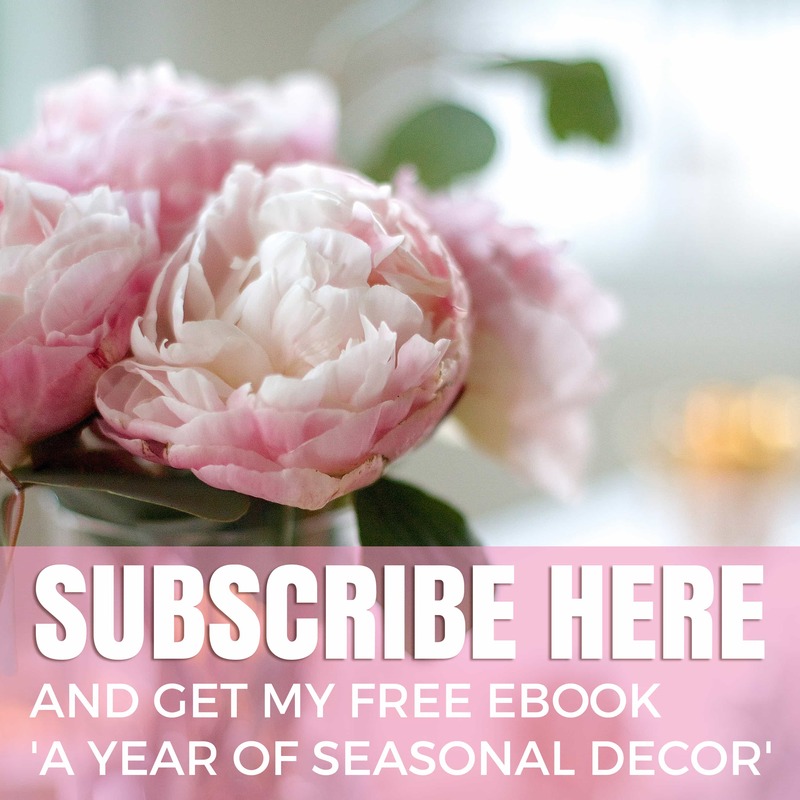 Dear Lory, thank you so much for sharing your post about how to add little luxuries to your home decor at my latest link party. 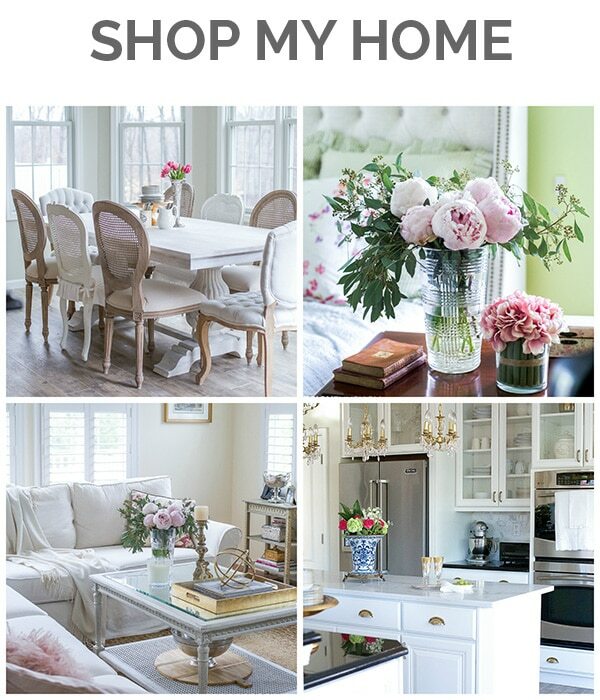 I loved your post so much that I featured you on my blog http://www.dagmarbleasdale.com! I get my sheets ironed. It is more than a little luxury, but I do a lot of do-it-yourself things to afford this luxury. there are excellent faux choices. 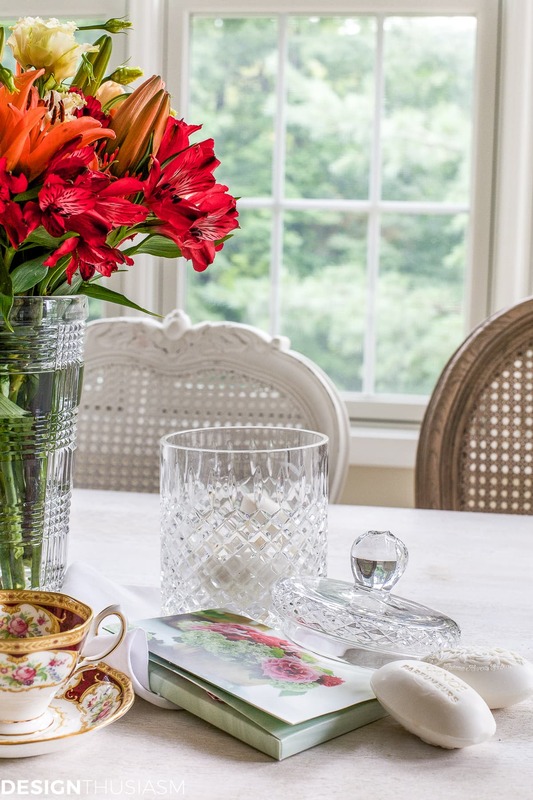 I love the cut glass biscuit jar and all things crystal. I am going to make everything around me beautiful-that will be my life. I’m glad I came across this post. I’m starting a new job in two weeks and I have no idea what my work space will look like. Having little luxurious items like beautiful notepads, pretty and out of the ordinary containers for office supplies, etc. make a new job much more bearable. Even during stressful periods (like the learning curve when you first start and are the “new kid” on the block), they can make you feel more serene and comforted. Absolutely true! So glad it resonated with you. Good luck on your job! !